If you are a serious bowler then you know the irritation a few games can cause the skin on your fingers. 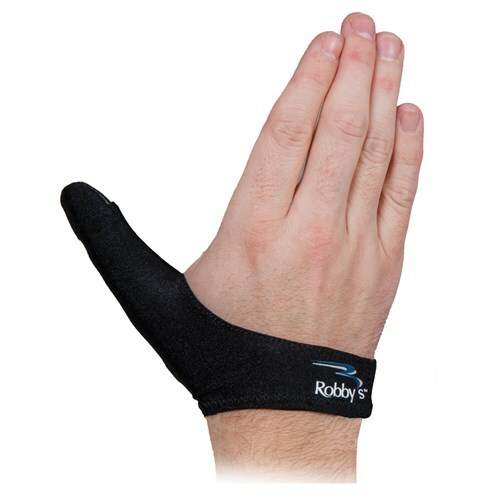 Robby's offers the Thumb Saver to protect against blisters, calluses, and swelling while creating a smooth release. Provides additional comfort and protection for your thumb from blisters and calluses. The tip of the thumb is textured to provide extra gripping power prior to release. Rubber tip is very large and doesn't fit good in my thumb hole, I had to get it drilled a little bigger so it would fit and not hurt my thumb. Otherwise a good product. I was looking for something to help end the constant tape battle when my thumb starts to swell. Put one piece of grip tape in ball under the pad of my thumb. Bowled 3 games today in league and never had to adjust my thumb hole tape. The neoprene stops friction and stops swelling so I have a very consistent release. Great product for me! I wore a size medium glove in the Army. I wear a cadet men foot joy golf glove. This glove fits perfectly. I can use it with my strike ball and my spare ball. My thumb was injured and this should prevent it happening. Like how the thumb hold can pull on it instead of my thumb. I use the thumb protector every time I bowl. I currently bowl in 4 leagues and practice up to ten games a week using the protector. Before I got the thumb protector, my thumb would swell and I would have a hard time getting my thumb out of the ball. After getting the protector, I found my release much cleaner, no matter how many games I bowl. The only reason I did not give it a five is that it is only good for about fifty games and then has to be replaced. The thumb grip is annoying. The inside threading is uncomfortable and it doesn't slip into the thumbhole of my ball very well either! So, I had the grip removed and then resewed the thumb cover. Perfect! Wish they offered one of these sans the thumb grip. I think more people would buy them. Everyone who tried mind complained about the thumb grip too. I preorder this product,wondering when this item will be in stock? Please email me when it arrive. Hello Jimmy! We are expecting that product to be released to start shipping in mid to late August. Back in late June you told me this Robby thumb saver will be release to ship in mid to late august still has not see it in stock yet why is the hold up? We received an update from the manufacturer that we should have this product in our possession in about 2 weeks. Is this in stock now? Hello Harold! Yes, this item is in stock now! i bought my first ball and started bowling 3 fingers for the first time. I bowled a couple games and it peeled the skin off the side of my thumb. I was told it was from gripping the thumb hole. Will this product help or will it be ineffective? Hi Austin! The Robbys Thumb Saver is made just for that! If you have rubbing or your skin is blistering, the Robbys Thumb protector will protect your thumb against that. Hello Eddie. Yes, you can wear a wrist support over the thumb saver if needed. 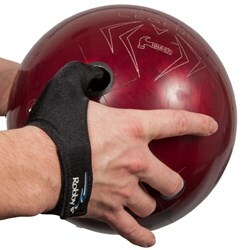 My question is, why they only make rubby thumb for right handed bowler. what about for artleft handed bowler? Free Ground Shipping is usually 3-7 business days. Can this fit a womans hand small? Yes, this should be able to fit a womens hand. Do you have to re-size your thumb hole to accommodate the extra layer of material? You shouldn't have to resize the holes but if the thumb saver is preventing you from using your ball, then you could resize your thumb hole if necessary. Due to the time it takes to produce the Robbys Thumb Saver Right Hand ball it will ship in immediately. We cannot ship this ball outside the United States.